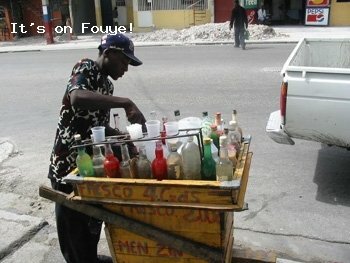 Do you think of Haitian STREET Vendors as Entrepreneurs? In Haiti, jobs are rare and many Haitian men and women resort hustling in the streets for a living. Do you think of them as entrepreneurs or something else? We call them "Ti Machann" and most of us do not respect them for what they do for a living. We have a tendency to respect the Haitian doctors, lawyers, even the "NOTAIRE", yes... a notary public, a service that is available at every post office and every UPS store in America, but is a really BIG deal in Haiti, but we have no respect for the "Machann Fresco" and the young man in the street corner selling phone cards for a living. Who do you think makes more money in Haiti? b) A "machann fresco" (he who sells FRESCO in the streets) who makes money every time he scratches a layer off the block of ice. The question is about the employees in Haiti Vs. the micro entrepreneurs who are not well respected in Haitian society. No one really respects the plumbers (aka bayakou), the cab drivers (aka chofe camionette), or any other businesses that are not linked to being "highly educated"
Do you think of Haitians Street Vendors and Businessmen as Entrepreneurs? « Origin Of Haiti Cholera Outbreak Confirmed, UN Haiti Cholera Report Completed! So you're justifying having a lighter complexion as a good thing? They do not curse you if you look at their merchandises, and do not buy anything. Why haitian go to Dominican republican to stay. To me dominican republic just more organize, clean,safe and have more light complexion than haiti. I do not see what is good about that place to go andure hard life there. It is not like USA, You can work for big money and have a better life than haiti. as long as they are working is all that counts...Here is to PEACE AND PROSPERITY. The street vendors are entrepreneurs but they are not businessmen. Most of these vendors worked for years for small change. A ti macham stays a ti macham. I have no issues whatsoever with a person who is trying to make some money to feed, and educate his children. Those small merchants are sending their children to school, and even Universities. The lady my mom use to buy earings from at the market has a son who became a doctor, and her other children are all professionals from selling small items on the sidewalk. I was there two weeks ago and as ma said it needs to be regulated. They take over the sidewalks and the streets leave no room for even people to walk by. Cars are weaving through them. It is really a hazardous situation. I absolutely think so, the street merchants are the driving force of what little economic vitality that exists. They are everywhere, in every corner selling anything and everything. They return day after day even changing post if they feel it will better their profits.